SnarkNotes: noun. The sort of review Susie does for books that wouldn't mesh with her usual review format. Graphic novels, nonfiction, fiction she's read before, and fiction she simply doesn't have much to say about all fall under the SnarkNotes category. SnarkNotes are usually brief and snide in nature. Today's SnarkNotes topic is... 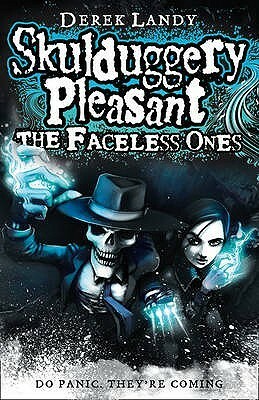 The Faceless Ones by Derek Landy! WARNING: While this review is spoiler-free, it WILL contain spoilers for the first two books in the series. Proceed with caution. so not only do Val and Skul have to prevent the destruction of the world, they have to do it without government help. clearly, this won't go horrifically wrong at all. and the scene where Kenspeckle is like "you should be treated like a child, because you are a child" and Val's like "you don't treat me like a child" and he says, "Of course I do. But you seem to have this ridiculous notion that being treated like a child means to be treated with less respect than an adult." "people don't like it when people can just pop in out of nowhere" YOU'RE TALKING???? TO???? A WALKING SKELETON???? Thank you so much for reading this SnarkNotes entry. If you liked it and would like to support my work, click on either of the buttons below to donate -- Buy Me a Coffee is a small, one-time donation, but becoming a Patron has several benefits and rewards. Either way, it's a huge help to me. A special thanks to those of you that choose to contribute! Even if you can't donate, you can feel free to follow me on social media; the links are in the top-right corner. If you've read The Faceless Ones, I'd love to hear your thoughts in the comments below!